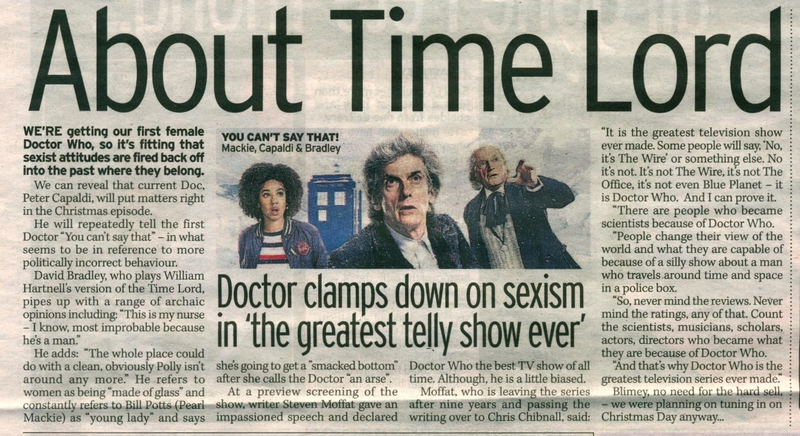 WE'RE getting our first female Doctor Who, so it's fitting that sexist attitudes are fired back off into the past where they belong. We can reveal that current Doc, Peter Capaldi, will put matters right in the Christmas episode. He will repeatedly tell the first Doctor "You can't say that" - in what seems to be in reference to more politically incorrect behaviour. He adds: "The whole place could do with a clean, obviously Polly isn't around any more:" He refers to women as being "made of glass" and constantly refers to Bill Potts (Pearl Mackie) as "young lady" and says she's going to get a "smacked bottom" after she calls the Doctor "an arse". At a preview screening of the show, writer Steven Moffat gave an impassioned speech and declared Doctor Who the best TV show of all time. Although, he is a little biased. Moffat, who is leaving the series after nine years and passing the writing over to Chris Chibnall, said: "It is the greatest television show ever made. Some people will say 'No, it's The Wire' or something else. No it's not. It's not The Wire, it's not The Office, it's not even Blue Planet - it is Doctor Who. And I can prove it. "There are people who became scientists because of Doctor Who. "People change their view of the world and what they are capable of because of a silly show about a man who travels around time and space in a police box. "So, never mind the reviews. Never mind the ratings, any of that. Count the scientists, musicians, scholars, actors, directors who became what they are because of Doctor Who. "And that's why Doctor Who is the greatest television series ever made:"
APA 6th ed. : Jefferies, Nicola Methven, Mark (2017-12-15). About Time Lord. The Mirror p. 26. MLA 7th ed. : Jefferies, Nicola Methven, Mark. "About Time Lord." The Mirror [add city] 2017-12-15, 26. Print. Turabian: Jefferies, Nicola Methven, Mark. "About Time Lord." The Mirror, 2017-12-15, section, 26 edition. This page was last modified on 30 March 2019, at 22:47.